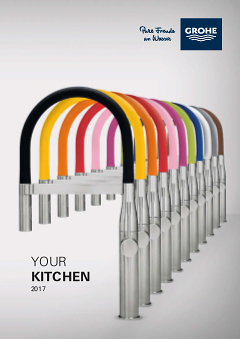 For your contemporary kitchen you want a tap that looks good and works hard. The GROHE Essence Professional single-lever mixer tap has striking industrial styling that will enhance any space, but the real beauty is the functionality, from the speedy fitting with our Easy Installation System onwards. It fits easily onto island units or underneath wall-mounted cupboards, offering you total layout flexibility. The spout turns a full 360˚ to reach every corner of your sink, while the professional spray is ideal for cleaning veg, filling pots and even switching across a double sink. The two spray options – a normal spray and a powerful jet spray – offer even more flexibility. The GROHE EasyDock M system also means that the solid metal spray head retracts easily and neatly when you’re done, guided back into place by a powerful magnet. It’s easy-to-clean too, with the GROHFlexx silicone hose offering a wipe-clean surface and SpeedClean silicone spray nozzles that can be cleared of limescale with a brush of your finger. And as an extra detail, you’ll find the hose available in a choice of colours – matt sheer marble, matt dark brown and matt dark grey – ideal for fitting in with any kitchen design style. Inside the monobloc mixer, GROHE SilkMove technology ensures life-long smooth and accurate water and temperature control. Plus the sparkling GROHE StarLight chrome finish is scratch-resistant for a dazzling surface that will last and last. Isn’t it time you took control of your kitchen like a true professional? This completely flexible hose with integrated 360° turnable spring makes using the spray head even easier. Plus the innovative santoprene surface makes it easier to clean than a traditional spring-style hose, making it more hygienic too.